Mirage looks like such a good book! oooh! I am dying to read being friends with boys! but like you, I'm overwhelmed by the amount of books i need to read!! great book week, no matter how small!! MIRAGE! Oh, I have to admit that I'm jealous. :D I really enjoyed HAVEN when I read it last year and can't wait for its sequel. Looking forward to hear what you think of it. Happy reading, my dear! Ooh, I haven't heard of either book, but I like the cover for Mirage. My books are in my Letterbox Love post. Being Friends With Boys looks super good, I am always in the mood for a great contemporary read! I can't wait to see what you think of Being Friends With Boys! Mirage looks (and sounds) awesome! I love that cover. Sometimes it's nice when we don't get many books. It's less overwhelming! Mirage--I haven't read that series though I've heard good things about it. Happy reading! Nice! Hope you enjoy both your reads! Envious that you didn't add a hoard of books to your TBR pile! I added way too many! ;) Happy Reading! Oh they both look so cute! :D I've yet to read Haven but I'll have to get to it some day! Happy reading, Christy! 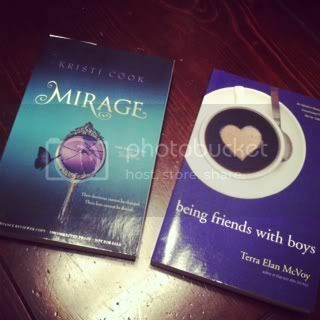 Oh I really love the cover of mirage, I hope you'll enjoy all your new books. Happy reading! I believe Mirage is a sequel to something I haven't read yet, correct me if I'm wrong. I have Being Friends With Boys on my TBR. Enjoy both your books! As long as there are books (or sometimes just A book), the week is an extra-happy one. :) I can't wait to hear your thoughts on Being Friends With Boys. It's one that I've heard good things about and would love to check out. Have a great rest of the holiday weekend, Christy!